Ive been messing around the last few days with trying to tie up some semi-realistic ballyhoo and large pilchard imitations. The target is Upper Keys Sailfish, and whatever else comes up on the live teasers. 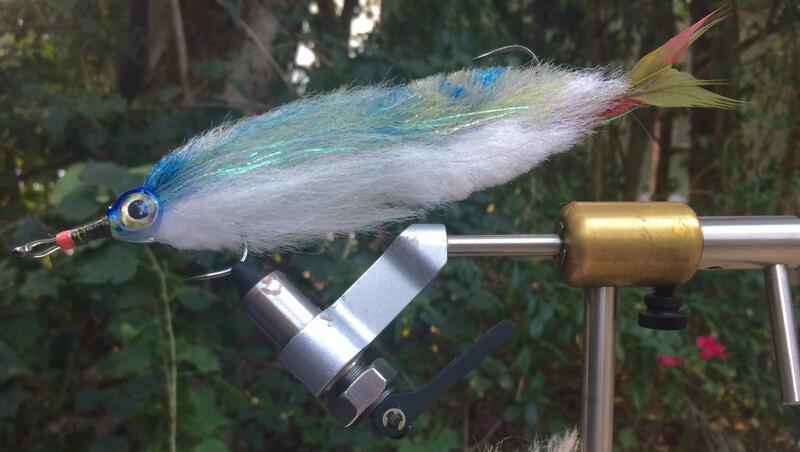 The big Ballyhoo is 10", tied on two owner 7/0 longshanks, crimped together with 125lb mono. You guys think they'll do the trick?.. any suggestions on improvements? The great thing about pelagics is they rarely refuse our offerings. You can throw whatever you like within reason. That being said, for mahi/amberjack/cobia, you'll rarely see me throwing anything bigger than a 5/0, and most profiles are under 6". 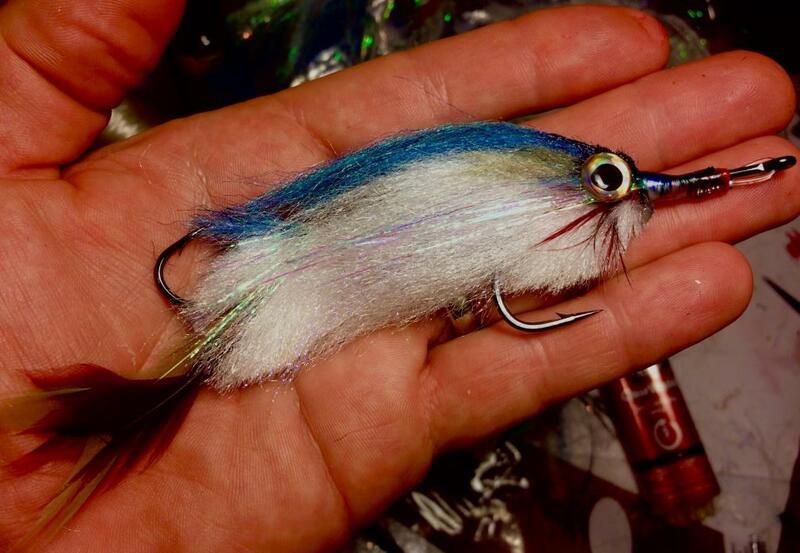 Sails/kings get smaller flies @ 1/0-3/0. While certainly not as fun as throwing ferret sized offerings, they're easier on the arm, and just as effective. Nice ties, merry Christmas. Funny, I did the smaller ones first and the capt and crew said "larger"... So I did the larger, double 7/0 ballyhoo, lol. 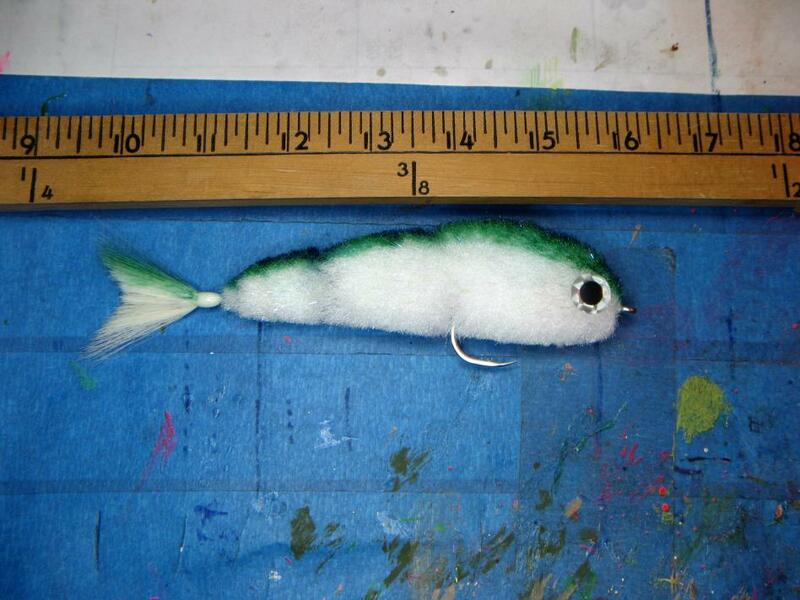 I think I'm maybe too caught up in trying to duplicate the live bait on the teasers, and like you said, once they're fired up they're going to eat whatever you get to em..
Did another double 7/0 yesterday... need to extend the body material longer over the tail. Whoops. Probably do a few more smaller pilchard patterns at your advice ODC, then call it ready.. thanks for the comeback. Nice flies. You might want to try the game changer type tail? Yeah, those types of tails do look pretty good. 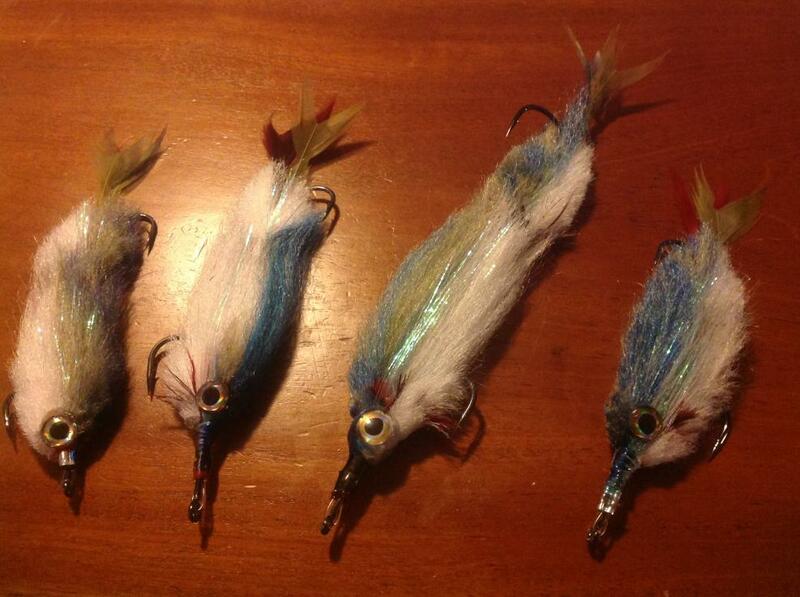 I've made them plenty, but often times I go and fudge up the whole fly when I make that tail. Something with not getting all of the body material at the exact same length before it's tied and cemented, then the body has a bend and corresponding wobble to it. 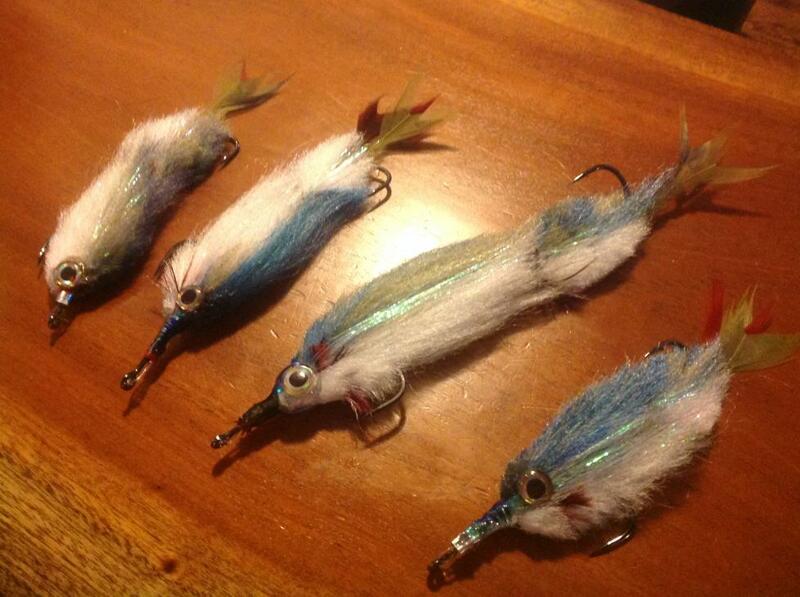 The hackle tails I'm doing, while not as good looking in the hand, are pretty **** good in the water. 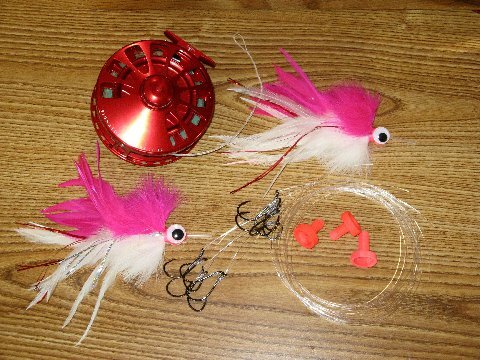 There are usually three different components, and they work as one while the fly is being stripped, to make a good looking swimming presentation. I may try a few w/ the GC tail though. I just get peeved entry time I spend over an hour on a tie, and then screw up the whole thing when I make the tail... guess thats more reason to practice it. 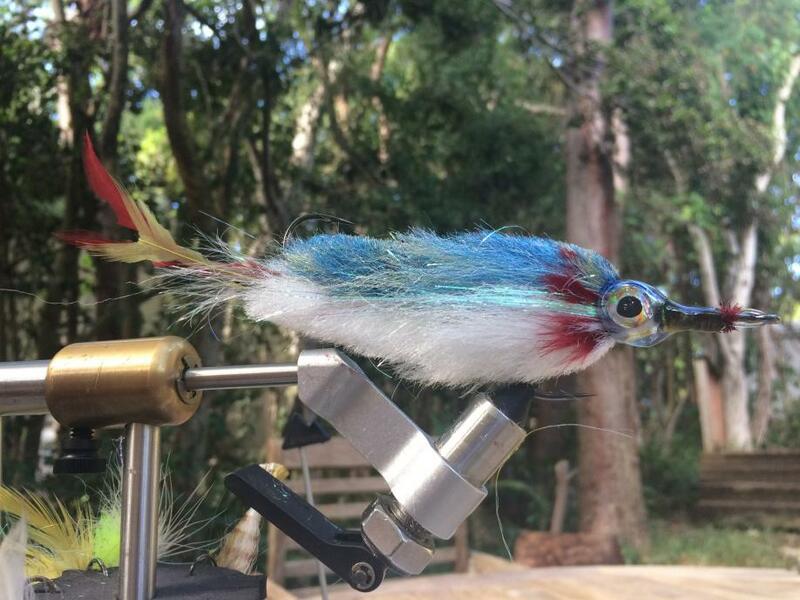 I was talking to Cam Sigler just last week on the phone about tails, he sent me a picture of his new fly (which I can't share) it's a turkey feather on a mono line, it's very interesting however I don't like it, I sent him some pictures of the game changer fly tails which are articulated and easy to make, I haven't heard back yet. Oh no, not saying you need to tie them smaller, just saying the smaller profiles are just as effective. Carl may have some different input, but there's a big difference between pacific & atlantic sails. Mahi are indiscriminate, they'll hit whatever you put in front of them, so no need to make it harder than it has to be. But if like seeing big flies get clobbered than that's what you need to tie. 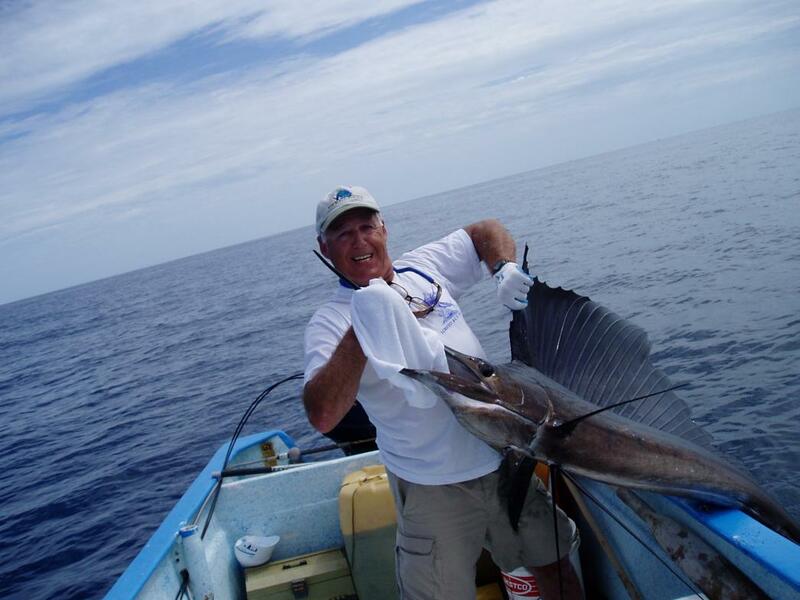 I haven't ever fished for or caught a east coast Sailfish. However from what I have seen they are really tiny. In Loreto where I have caught literally hundreds of Sails, they seem to average around 80-100 pounds, in Guatemala they are even bigger. Hey Carl, no I'm definitely good on the double hook/crimped mono rig.. I appreciate it though. 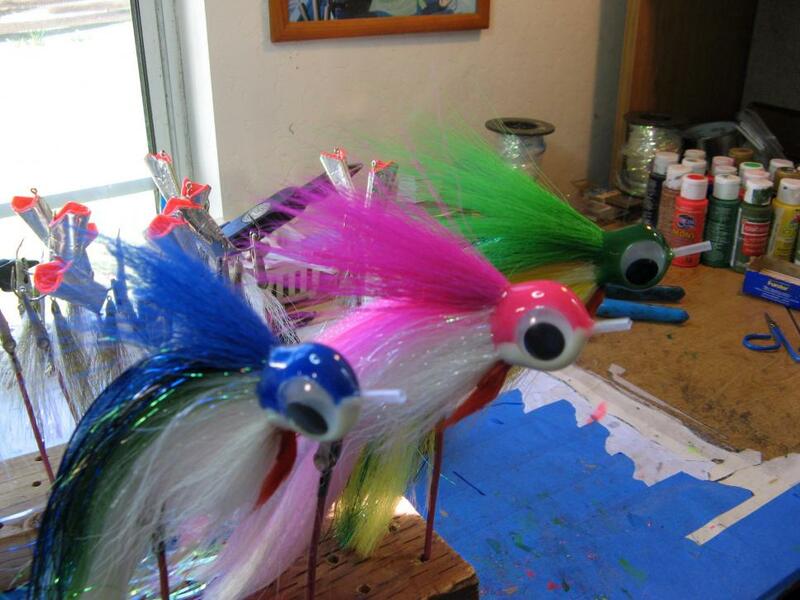 I can visualize Cams turkey-tail... swims like crazy I bet. Yeah, PAC sails are bigger on average, and more fly cooperative...but our spindlebeaks aren't tiny by any means, I'd say they average 40 to 60? 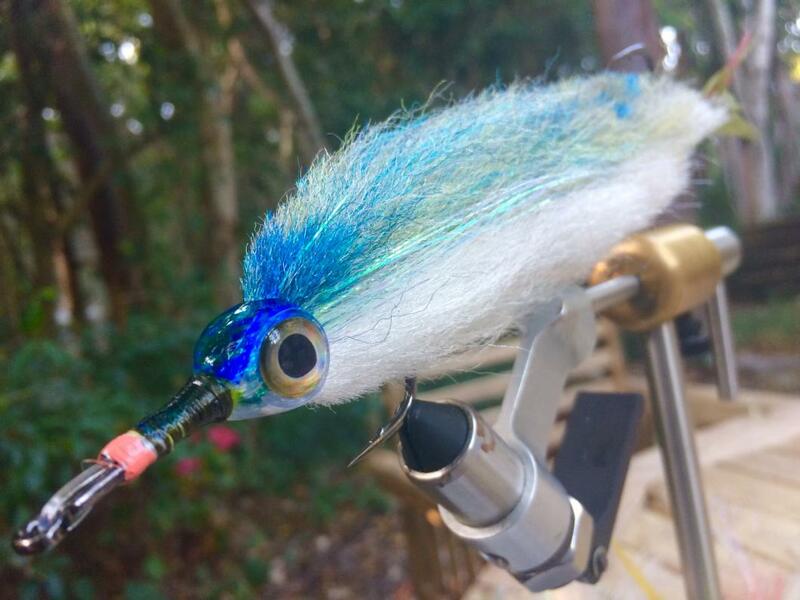 I have caught them on fly prior, but it's been a while and I'm tying these up for the upcoming FL Keys Outfitters SailFly tournament, and corresponding practice days... so mainly looking to target sails, but we'll throw at whatever we tease up. I'm going to tie up more small pilchards regardless ODC, I think it's good advice... especially if it's blowing 25 out of the NE. No need to be chuck and ducking with a articulated feather duster in those conditions. I suppose that depends on what you call tiny. I'm 6'2" 220lbs for scale. This was the first and last sail I ever took out of the water. I didn't mean any disrespect about the size of your east coast Sailfish. As I posted earlier I haven't ever fished for or caught Sails on the east Coast. I was posting a opinion of what I been told by others who have actually caught all the different species. 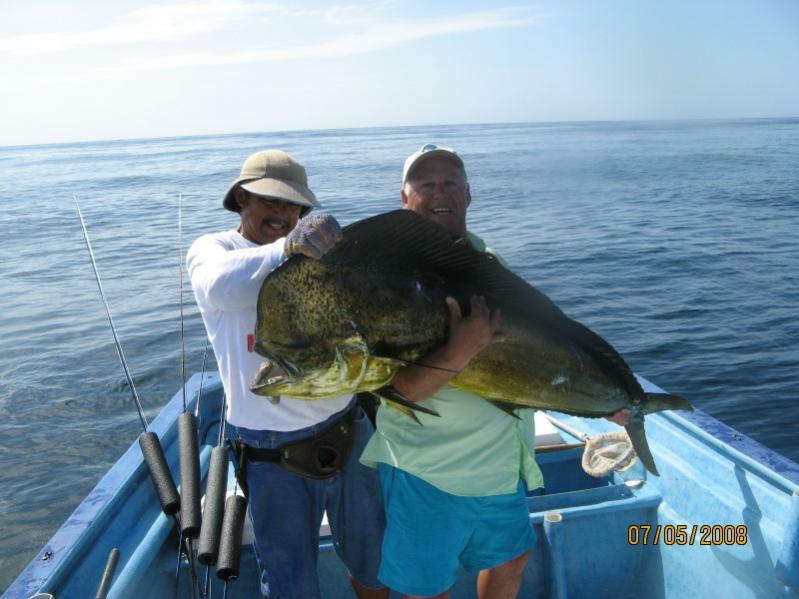 I have a picture of a big mama sailfish some where on my computer I caught in Loreto that must have weighted around 150 pounds, of course I released it, I haven't ever killed any bill-fish in my life. Soon as I return from Guatemala hopefully I will have lots of pictures of the bigger variety of Sailfish from down there. Lol! No, I literally meant it depends on what you call tiny. I know absolutely nothing about pacific sails. I'm not the thin skinned sort. Sometimes I say things on here and get beat -up over it, Just wanted to make sure. Lol! You get in your licks too. Seriously, tact is not your strong suit, but you contribute a lot of good stuff. I usually don't have much sympathy for folks who provoke you, or the people you provoke provided no forum rules are broken. Typically I'm forced to watch when a thread goes south. Not much I can do as long as forum rules are adhered to. Not sure if you've noticed, but I don't really do much moderating. This part of the forum is pretty low maintenance. I dunno what the heck you guys are talking about... lol. Happy upcoming New Years to all you feather chuckers out there! I think I nailed down a final pattern for the ballyhoo. 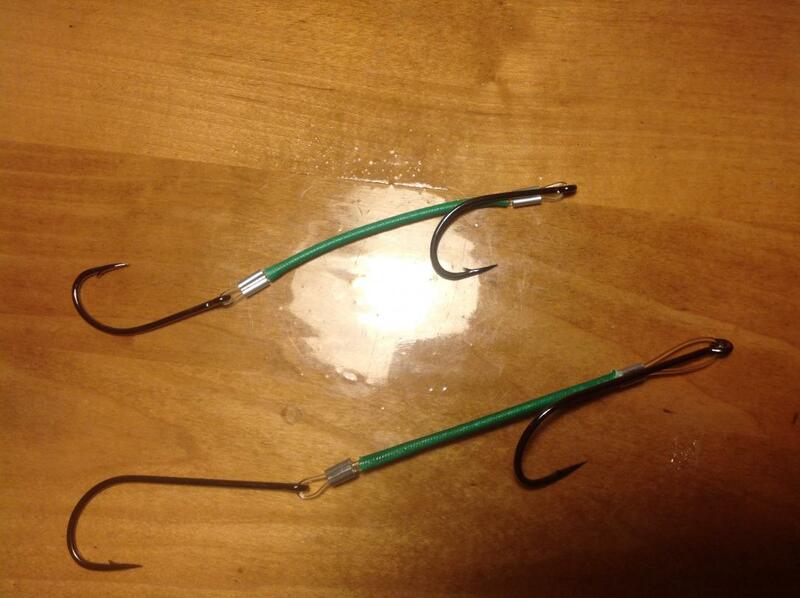 I am not trying to start an argument, I am mostly just curious why you choose to run the mono up through the eye of the hook as opposed to use a tube or the standard wire rig for the double hook set-up? Again, just curious. What I like about the tube set-up is it's so easy to change out dull hooks, or sometimes a broken hook tip. Couldn't find the tube supplies locally... it's something I want to look into eventually, because I know of it's virtues... but I do very little bluewater fly, so it hasn't been a forethought until a week or two ago. Here's what's underneath all the EP Fibers.. Owner big games, crimped together with 125 lb mono, covered with chafe guard. I tried a few with the tail crimped to the lead hook at the bend, as opposed to the eye, and then also whip finished into place. But those didn't quite sit right.. Your flies will certainly work, no problem with that. I am posting a picture of the double hook rigs we will be using in Guatemala, They are just a little different from the Loreto leader. I use # 80 pound Berkley big game line in clear. If you use Seaguar it will last 2-4 times longer, however it cost about 10 times more....Berkley is soft-clear and cheap and makes great knots. I hope some of this helps if you decide to tie more Blue water stuff. Thanks Carl, yeah like I said, I'm aware of their virtues... I've used some store bought tubes prior. But never rolled my own...my main question is: what is the tube material? Are they acrylic, or? I buy my tubes in New York, They might even be ink cartridges, they cost about a nickle each and you have to buy 500. I know lots of other fly guys go to the hardware store and buy little PVC soft tubing used for ice maker and water lines for pennies. I really like using tube flies. Thanks Carl, it does help. I thought there was some specialty tubing specifically for it...haha. 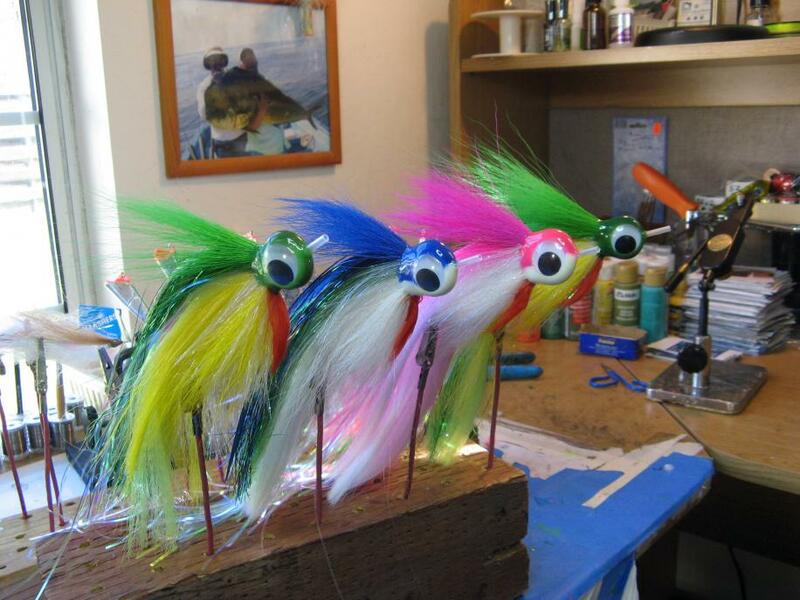 Probably is, but like every other aspect of fly tying, improvisation gets it done..